What are you thankful for ?? Mikey's TMNT and terrible2z ..i know for a fact is super-charged by all our friends and fans. For almost 8 years now we've seen some of the craziest Turtle times and the harshest spit n' spadoodle the Foot Clan could shell out!! We've survived Triceratons (weigh a ton),Alien Invasions, Time Travelin' Trivails, Next Mutations, runchabungas,Inflatable Raphael Chairs,Mad science, Dragon Lords,Cody Jones,Krang Bangs,Bebop n' Rock, fourth Turtles movie teasers , n' tOkKa's terrible coding skills !! Somehow we've made it.. but couldn't be doin' it without our friends !! That's a deff' !! Mikey's TMNT friend base is global & galactic..reaching Turtle fans of all kinds !! We love you all.. and on behalf of terrible2z , MIKEY P.,Xipe, and the rest of the forum staff n' friends.. we all thank YOU !! People have been saying to me that they have been sending me messages for weeks now to tOkKAb2@terrible2z.com .. only to have their message bounce back to them or totally disappear and have me not get it at all. I got a hold of my server and fixed the issue. You should be able to email me and not worry about bouncin' baby messages. Both addies :: tOkKAb2@terrible2z.com and tOkKAb2@gmail.com are the same.. all messages go to the same email box (just as long as both email addies are in sync ..) Sorry for the mix-up,guys.. i'm one snazzle-frazzled snapper. Also Update for Mikey's TMNT and t2z real soon. Just let me catch up to the rest of my day. Thanks guys..luv ya !! I think it will more and more profect. I make the turtles room on it. -Hey ,tOkKie-rochas !! I'm always happy to pimp your personal TMNT website right here as i can make the time !! Just email me your request @ tOkKAb2@terrible2z.com and i'll include your site in my next update !! --..From Previews NOV 2006 ..these books should be available January 2007 !! -->> Woot,tOkKa-Spookables so much goulin' these last days of OCT- ..it's despecable !! Berger, Steve Murphy, Eric Talbot, and Michael Dooney. getting a copy with autographs. --Last week the Dark Turtles were all abuzz..and it took tOkKie tip-toe in' around town to track all four evil clone-galloots !! Super Sculptin' (but weird articulation..)makes these really stand out in amidst the entire Turtle Line !! "Toddler TMNTs have cropped up in various stores (particularly the ENtertainer) and are retailing at £3.50. 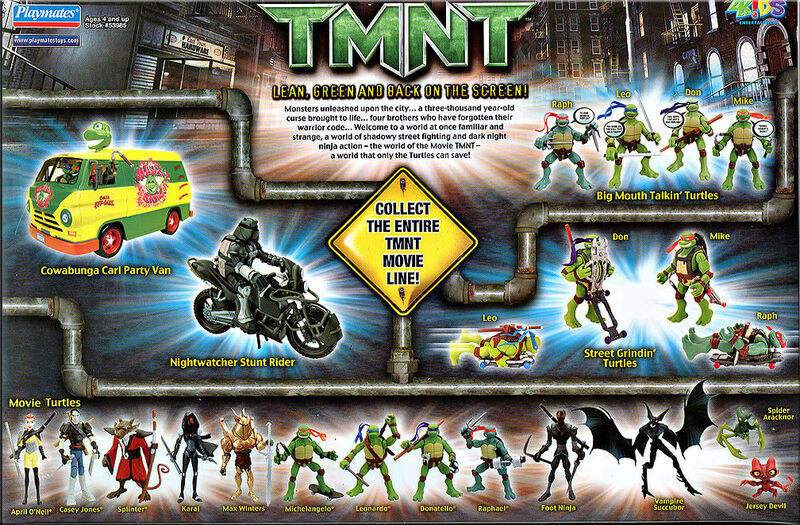 With the price reduction on all TMNT items and the shelves gradually being dominated by the new Biker Mice line, things still don't look too good for TMNT. " -->> Once again..thanks to Amazin Turtle !! ..Officer Biggles,Dark Turles,Prez.Bishop,Starley,Wrasslin' Raph,Triple Threat,Agent TMNTs,Dojo Turtles,Dark Splinter n' more!! .. The next waves of TMNT- FF are bound to cause more contraversy and fun ..!! Give 'em a gander if you dare on Figures.com .. **Click here for the full 'Future looks Bright' gallery from the Fall Toy Fair !! -->>T-drome had this posted awhile back..but it slipped thru My spikes. Expanding the original Movie 4 line previews fromt he past few months. Closer look shows Karai, Foot Soldier, Winters,and some more intresting villians !! Special thanks to Amazing Turtle for the info !! -->> Schools back in session..the fall colours are in bull orange, n' yellow boom ..the ghosts n' gLobbins come sneekin' out of the sewers n' start slimin' n' sloppin' on tOkKie's once rusty,dusty trail !! The Boogerman is out to bug yir snapper pal with buggerboos..and the trick is to get thru' this creepy month is to go diggin' out the Turtle treats !! tOkKa lights the lantern,Jack- O'.. on a 'Round-Up' so sweet it's SCAREY !! -- Also checkit' out the main main page (**here) for some snap shots of the green gang in Israel !! the TPB of Tales of Leonardo Blind Sight. Uhh, yeah.....I'd say it's some improvement, ;-) There are some dead links still, as not everything's been put up yet. I may eventually add an animated Flash splash page too (dang my Flash skills are rusty). -- Sh'okanabo,Viral, and Jammerhead are finally raiding Toy pegs now ready to take on Cody and the Turtes..
-- Leftover from official updates,T.N.I. has the big evil guy there Leo and a Movie Roleplay set to scope up close ..**Click here !! 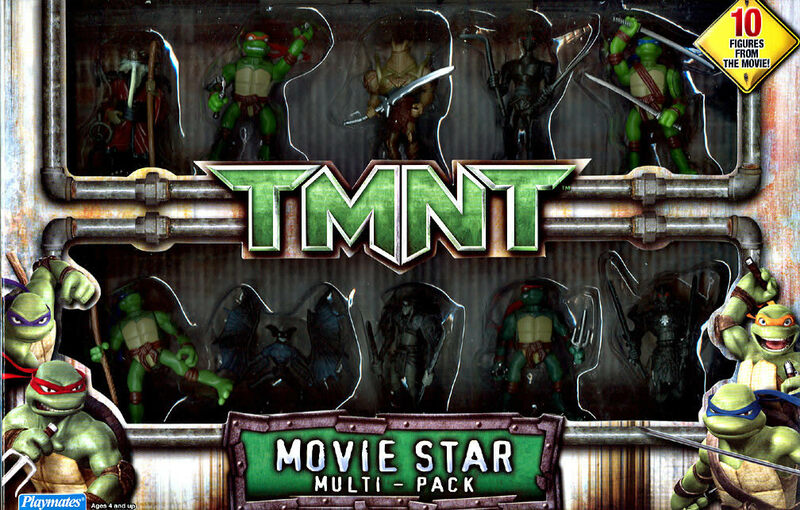 ..and Figures.com has the big picture on the guys' TMNT movie figs ..from the NY toy Fair.. **Click here !! .. ..back later,Bugger Boos.. tOkKa's gonna go steal some lil' gobblin's Snicker bars !! .. err.. i mean borrow.. yeh ..BORROW SOM SNICKERS.. err..